This portion of the South Prong Trail at Roaring Plains Wilderness in Tucker County, West Virginia is an easy 5 mile out-and-back hike to a campsite tucked away in the wilderness and an amazing view of Dolly Sods and the Red Creek Plain. 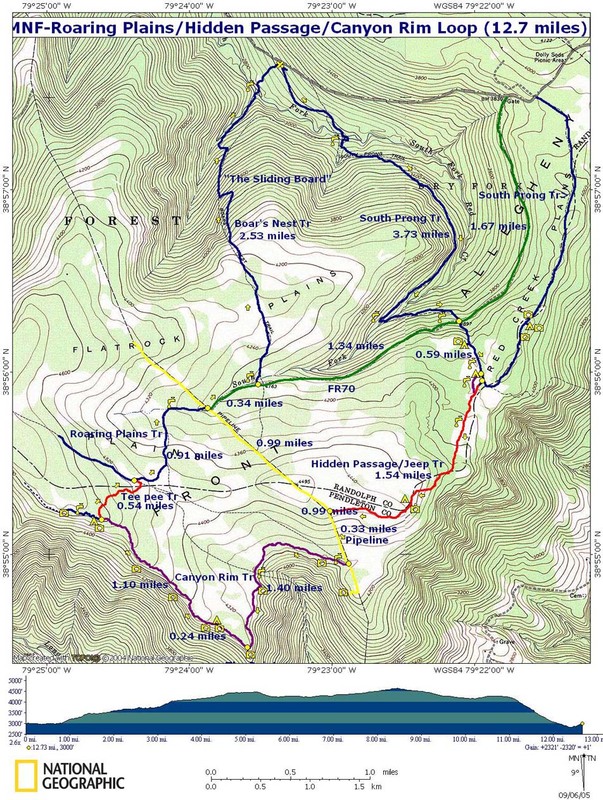 Please note that the South Prong Trail is much longer than what's provided here - the trail eventually crosses the Roaring Plains FR-70 Trail and continues on to make a loop with FR-19. The trail starts off along FR-19 just south of where FR-19 meets FR-75 (the road to Dolly Sods) and passes through coniferous forests with rhododendron and mountain laurel lining the trail. If you show up between June and August, you'll find the mountain laurel and rhododendron are blooming, which makes the hike even more interesting. You'll also pass some 'rock rivers' along the trail, which are open areas of rock that were left over from fire that previously burned away the topsoil. Around mile 1.1 you'll come across a section of the trail that feels a bit more open with a bare spot of rock through the trees to the north - from here you can see the tops of surrounding hills to the east, which is the southern section of Dolly Sods and the Red Creek area - behind those hills is the Red Creek Trail. Continuing on further, you'll find some smaller campsites along the side of the trail. Lookout point: Eventually, at mile 1.7, you'll come across a section of the trail that has a peek of a view through the trees with some small trails leading out to a larger lookout point. From this lookout point you can see an amazing view of the Red Creek Plain and even the top of the Bear Rocks Preservation in Dolly Sods - the tallest peak due north from the lookout. Campsite: From the lookout, you'll hike for another 0.8 miles until you reach a small trail on your left - this is the Hidden Passage Trail that leads further into the Roaring Plains Wilderness, which I highly recommend hiking. To get to the campsite, hike for an additional 100 feet or so beyond the Hidden Passage Trail to find another small trail on your left - this is the campsite trail. Walk down the trail to find a creek, campsite, and some blueberry bushes on the hill behind the site. The Roaring Plains Wilderness is one of the last great secluded areas where backpackers can find some solitude. This section of the South Prong Trail is a great way to get into Roaring Plains to experience some true backcountry West Virginian trails. For even better views and more Roaring Plains hikes, check out the Hidden Passage Trail to Lookouts.